It doesn’t matter if you’ve tried every marketing technique in the book, if you’re not onboarding users successfully it counts for nothing. Why would you invest so much in trying to attract users to your product, but not go the extra step and try to keep them? 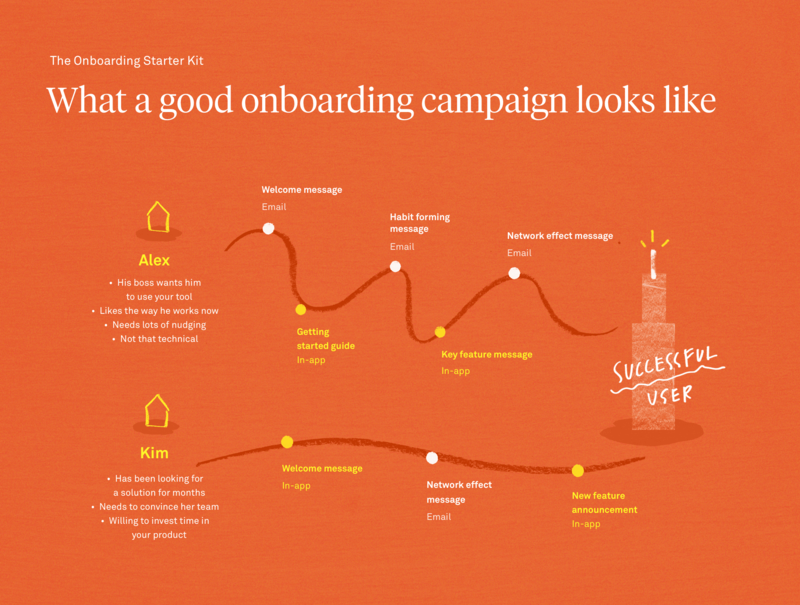 Today we’re releasing The Onboarding Starter Kit to help you do exactly that. Over the past six years, we’ve discovered the only proper way to onboard people to your product is to understand where they are and where they want to get to, and then use a combination of nudges, prompts and outright persuasion to help them get there. In our experience, a well-crafted onboarding messaging campaign is one of the most powerful tools at your disposal. Unlike fleeting product tours and crude, Clippy-like modals, onboarding emails and in-app messages are perfectly attuned to long-term relationships. In a world where 40-60% of software users will open an app once and never log in again, they give you that magical ability to reach beyond your product to help new signups make progress towards long-term success. In The Onboarding Starter Kit, we’re sharing some of the messages we’ve used to onboard thousands of our customers and grow our business. 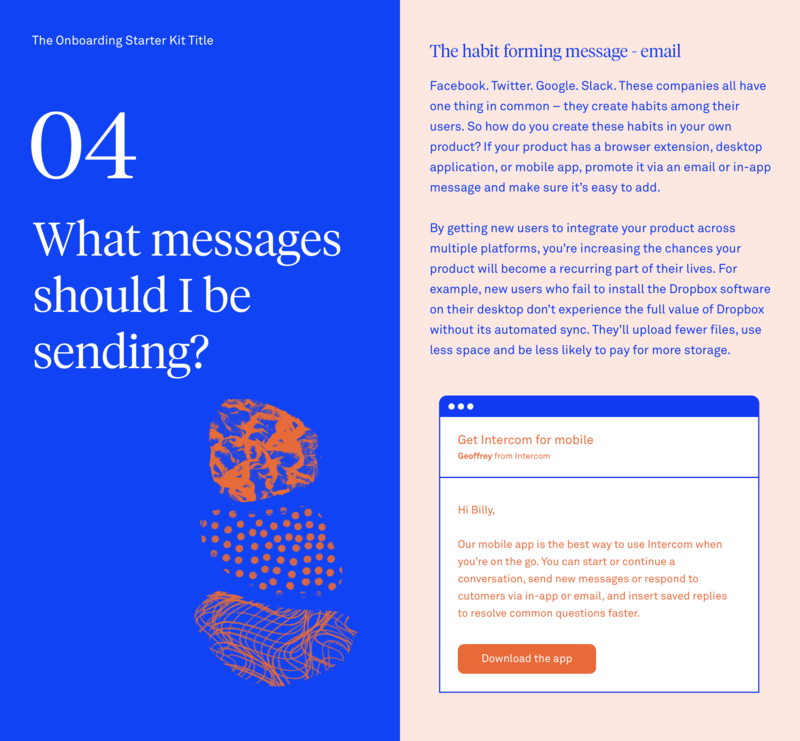 Like our book, Intercom on Onboarding, there are no abstract principles or vague philosophizing, just relatable advice guaranteed to help any business onboard their customers. So, what’s inside? First off, we’ve included half a dozen good messages you can start sending right away. You’ll also get some 101 advice on onboarding best practices, a guide on how to measure the success of your messaging campaign once you hit “send”, and a real-life example of a company who is doing it right. Most of our advice is absurdly simple, and requires nothing more than a few hours, a pen and paper and a product to send them with. (We’re obviously biased and think Intercom is the best way to send your onboarding messages but no matter what tool you’re using our advice remains the same). One of these messages in isolation won’t deliver engaged users overnight. But taken collectively, a series of onboarding messages gives you the best chance of activating new signups, customizing their ensuing journey, and ultimately, ensuring as many new users become successful ones.